Bonus Party Chain Attacks. Continuing from yesterday, after the 3 initial attacks of the chain are completed, you may get the chance to trigger another attack to add to the chain. These attacks are trigger based meaning you have to press a button at the right time. If you have good affinity (relationships) between characters, the chance for adding attacks to the chain increases. It is possible to have multiple bonus attacks per chain attack. 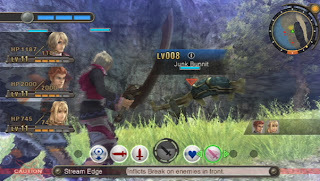 The image shows that the blue chain attack bar at the upper-left corner of the screen is full, meaning, a party chain attack can be initiated.